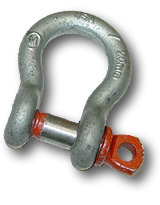 To prevent losing your anchor because your shackle pin backed out, don't bother with one of those paper-covered metal twist-ties that can rust or break off. Loop a small nylon cable-tie securely through the shackle itself and through the eye of the pin. Removing it is as easy as cutting the tie, but it won't come off until you want it to!